Add something unique to your Christmas lighting display this year! Festoon lights are the perfect blend between retro Christmas style and modern living without losing their original seasonal charm. Use them around large tress inside or outside your home for a statement bulb and brightness that’s sure to attract attention, unlike standard fairy lights these bulbs won’t get lost in heavy foliage. You could even take your festoon lights out of the festive season and drape them inside and outside your home all year round, they look great against fences and brick walls! 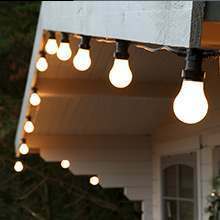 Create a unique style in your home this Christmas with our festoon lights! 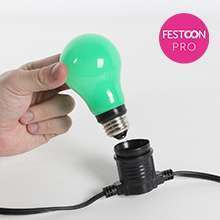 Available in a range of power sources, sizes, shapes, bulb and cable colours you can be sure to find the exact lights for you. Whether you need battery lights for your outdoor tree, or cool retro ones for your living room these versatile lights use the perfect blend between retro Christmas style and modern living without losing their original seasonal charm. We love to use them around large commercial or outdoor trees for a statement bulb that can’t be missed unlike some smaller standard LEDs which can get lost in large ferns. 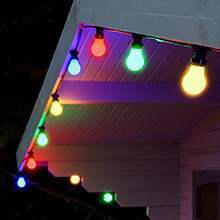 Possibly the best thing about our festoon lights is that you don’t have to take them down at the end of the Christmas season , they’re so versatile that you can keep them out and continue you to use them inside and outside your home. Don’t believe us? 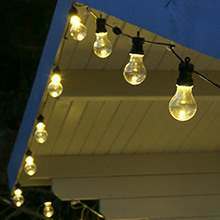 See for yourself, the moment your other Christmas decorations come down you will see these lights for what they truly are the perfect trendy bulbs to turn your outdoor area into a stylish bistro or your bedroom into a cool New York city loft.